Frederick began his life at LSBU studying a Foundation degree in Power Distribution, graduating with a merit. His success spurred him on to continue his LSBU studies with a BEng in Electrical and Electronic Engineering, where he enjoyed even greater success and graduated with first class honours. 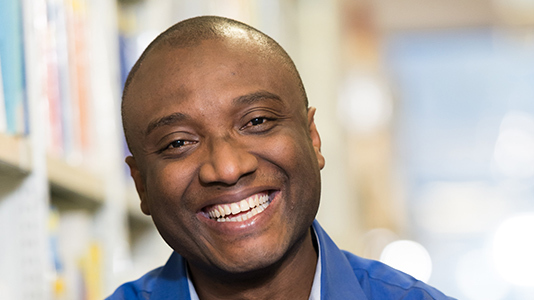 When Frederick wanted to continue his education with a Masters degree, our MSc Sustainable Energy Systems was ideal for him. It would build on his past achievements while developing his passion for generating energy from renewable means. Furthermore, the course provides the Masters level academic requirements leading to Chartered Engineer status when following on from an appropriate accredited BEng degree. This matched Frederick's career aspirations perfectly. "One of the things that attracted me to LSBU is that it is among the top ranking modern universities for graduate salaries," says Frederick. "They equip graduates with the right skills for their future career success which is important to me, and it is also great that it is close to my family and friends." "In the future, organisations and government bodies will be looking for experts capable of advising, designing, building and confirming energy policies. With this qualification, I am hoping to be one of those experts, working with companies like UK Power Network to continue my learning and become a chartered electrical engineer," he says. Funding his continued study remained a challenge for Frederick. He felt that his postgraduate education may have to wait while he embarked on a career, returning to his studies once he had saved enough to fund his studies. As an alternative to delaying his education, however, he applied for a Kevin Herriott Scholarship, funded by LSBU alumnus and entrepreneur Kevin Herriot. The scholarship is available every year to students on MSc Sustainable Energy Systems, and is awarded on the basis of academic excellence. With a value of up to £4,000, Frederick knew that winning the scholarship would enable him to fund his degree. He was delighted when his application was successful, largely thanks to his first class honours degree. "I was absolutely over the moon when I discovered my application had been successful," says Frederick. "It is a moment I will never forget and something that has had such a big impact on my life and the lives of those around me. I never thought the opportunity for postgraduate study would come to me so soon in life." For more information visit the Kevin Herriott Scholarship.